So I have no idea how I found this app. I may have just been browsing on the iTunes App Store and it just popped up. 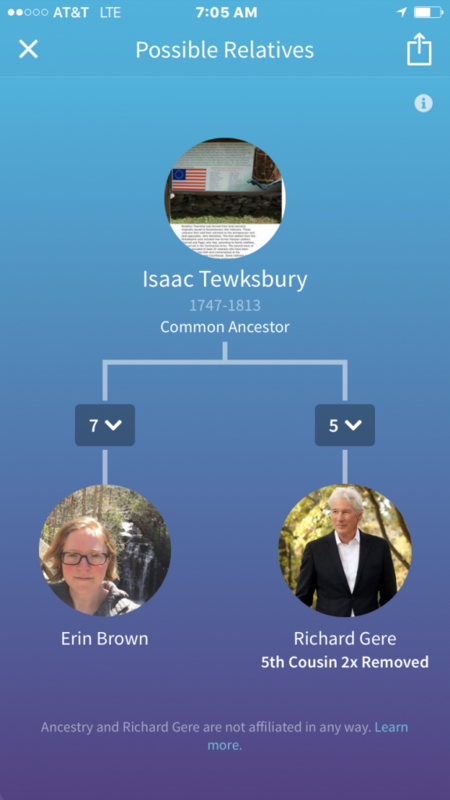 We’re Related uses your ancestry.com family tree to find out which famous people you are distantly related to. It’s really actually pretty fun. About once or twice a week I get a little pop-up notification telling me that I have a new relative! Most of the time it’s SUPER distant…like so distant that I’m not even sure that the line it’s providing for me is correct. But every so often I find one where we’re like…5th cousins! Awesome! At least on my side, through my maternal branch, mine is traced correctly! You know what movie I love? First Knight. So good. That’s my cousin! The internet really has provided me a place to research and carry out this hobby without having to leave my home very much. This is not because of magic. I know the internet seems like magic sometimes, but this information got onto the internet somehow. I wish I could personally thank every person who has ever posted a picture of an ancestor that I have yanked and added to my personal collection. Sometimes I do. Sometimes I can’t! So I pay it forward and also try to give credit when I “borrow”. I do a little work hoping that some person some day might be able to use the little thing that I’ve done. Genealogy karma. Maybe you’re not supposed to do things hoping that it will come back to you, as that’s not very altruistic. What are the karma rules? I am the first to admit, the concept of this website is a little morbid and I think it freaks people out a little bit (especially when they find out I have the App on my phone). Even though it’s not the prettiest website in the world, findagrave.com is one of the most useful websites for genealogical research, at least in the United States. I think about how many brick walls have been cracked with the assistance of this amazing tool. As we all know, finding a death date is one of the more important things when looking to find records. But what if a great great grandfather died in Scranton, Pennsylvania and I live in Indianapolis (this is all a true story so far) and I don’t have a death date but I know who his wife is and when she died. WHAT DO I DO!?!?!?!? Well, hop on Find-a-Grave, and do a search to see if someone has already posted his information. If someone has posted information but you’d like to see what else is on the headstone you can request a photo and a volunteer could potentially go out and photograph it for you! Is that not amazing? 21st Century Magic. So what do I do? There is a cemetery by my house called Concordia Cemetery. It’s the closest one to me and I’ve spent a lot of time walking the rows of headstones attempting to catalog those that have not yet been cataloged. Sometimes I’ll drive over to the Catholic Cemetery. I have a little corner I’ve been working on over there, but the cemetery is so large it feels a little futile. Concordia can be defeated! Concordia Cemetery is very German. 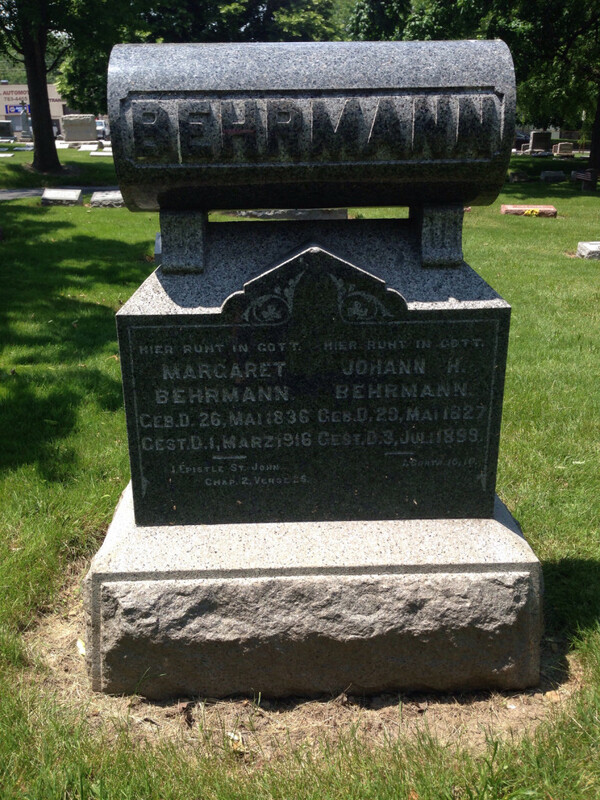 Check out Johann and Margaret Behrmann. Headstone actually written in German. Also while I’m out and about on little trips I’ll look to see if any nearby cemeteries have photo requests and I’ll go about and try to fulfill them. Because you know what? People do it for me. Karma. Besides the good feelings and potential volunteer work I will receive in response, why else do I do this? Well, I love cemeteries. It’s my version of adult coloring books, I guess. I also find out some amazing history of the place where I live. For instance, one day when I was rolling through Holy Cross Cemetery by my house I realized that the Chevrolet family is buried a mile from me. Like…as in the cars. Like the actual Chevrolet family. Here! Here they are. Check it out here! They didn’t even live here (we are obviously not Detroit), but they were buried here because of their pride in their cars in the Indy 500. Gotta love the history. Alright kids. I’m sure some of you out there in my readership world know how much I love Groundhog Day. I have been sending out an annual Groundhog Day email now for about 15 years. This year I decided to combine my passions for groundhogs and old newspaper articles. Here is what I found, one of the funniest articles I’ve ever read from 1860, written by Sol Miller, for the White Cloud Kansas Chief. Now of course I have to learn more about this guy, but that will be for a later date. In my email I said there would be a link to the actual article along with the accompanying poems. So here it is. Happy Groundhog Day everyone! Here is the transcription if you don’t want to squint and read 1860 text (although it’s really not that bad!). I also left out the super offensive bit of the transcription because I just couldn’t type it. Bad form, Sol. This is Ground-Hog’s Day. Today at precisely the hour of noon, the Groundhog will leave his hole; and if the sun is clouded, so that the animal cannot see his shadow, he will remain out, and Winter may be considered as ended; but if he sees his shadow, he will retreat into his hole, and remain there for six weeks, during which time we may not look for a permanent breaking of Winter. The Ground-Hog is of ancient origin. From the most reliable data accessible, it is pretty well established that he was created on the sixth day of the year 1. He was the last and wisest of the animals created; and next after him came man, wiser than he, in all matters excepting those appertaining unto the weather. Noah entered the Ark on Ground-Hog’s Day. He stationed himself at the hole of that weather-prophet; the animal came out, saw its shadow, and drew back again. Noah knew, from this, that there would be bad weather for six weeks, and forthwith betook himself to the Ark, carrying the Ground-Hog with him. Two days afterward the rain commenced pouring down, and continued forty days and forty nights. This, with the two days above mentioned, made just six weeks. In all the world, Noah and his family were the only believers in Ground-Hogs. The balance were disbelievers, and perished. It is proper for us here to state, that in Noah’s country, instead of Winter, they had a wet season. Solomon was a ‘fast’ man, as well as wise one. The secret of his wisdom was this: He believed in Ground-Hogs. In those days, Jerusalem and Babylon were rival towns, contending for the trade of the ‘back county.’ Solomon was one of the principal stockholders in Jerusalem – in fact, he owned most of the shares, and was President of the Town Company. At length the proprietors of both towns determined, as soon as Winter should break up, to make great improvements; as it was evident that whichever town should soonest erect the largest number and the finest buildings, would draw the Spring emigration, and secure the County seat. The Winter was a severe one, and the proprietors of Babylon did not think of commencing operations before the middle of March. On the other hand, Solomon kept an eye on Ground-Hog’s Day. The day was cloudy, and his Hogship remained out of his hole. Solomon immediately set to work with such energy, that at the expiration of six weeks he had his magnificent Temple far under way. When the ‘Babylonikers’ heard of this, they gave up in despair; and then it was that they ‘sat down by the waters of Babylon and wept.’ When the Queen of Sheba visited Solomon, he taught her the Ground-Hog sign. This it was that so pleased and astonished her, and sent her home in such a fine humor. Solomon had pet Ground-Hogs for his numerous “better-halves” and they caressed them like kittens and lap-dogs. It is a singular coincidence, that the Temple was destroyed on Ground-Hog’s Day. The Israelites crossed the Red Sea, and David slew Goliath, on Ground-Hog’s Day. Romulus laid the foundation of Rome in accordance with the Ground-Hog sign; and Alexander invariably consulted the Ground-Hog before breaking up Winter quarters, to start upon his Summer campaigns. From the earliest ages down to the present day, the believers in Ground-Hogs have been numerous. In Rome there existed a secret Order, called the “Royal Ground-Hogs.” Indeed, the Order is said to have been founded by King Solomon himself, and that they met in the upper story of the Temple , at Jerusalem. From that Order sprang the present Free Masons and Odd Fellows. Ground-Hog’s Day is called by the Germans, “Lichtmas,” the English of which is “Candlemas.” The term originated thus: In Germany, in order to prevent the early shooting of grape buds, and consequent liability to have them destroyed by freezing, it was desirable to have cold weather continue until the middle of March. Therefore, when it was cloudy on Ground-Hog’s Day, and they had reason to believe he would remain out, and bring on an early Spring, the people would visit his hole in mass, with lighted candles, in order to produce a shadow, and frighten him back. This would keep the weather cold for six weeks. Ground-Hog’s Day is likewise sometimes called by the Germans “Fastnacht,” or, in English, “Fast-night.” Upon that day they fry an abundance of dough-nuts, or, as they call them “Fast-nacht cakes.” They originated thus: The Ground-Hog sleeps until the time for coming out, and therefore requires no food; but the Germans, when they frightened him back with lighted candles, fastened up the hole, to keep him in six weeks, that the weather might remain cold. They feared the animal might discover the deception that had been practiced to drive him back, and attempt to come out and bring warm weather, unless the hole was stopped; and if he made such a discovery, he would not sleep,and would consequently hunger. By that patient investigation and experimenting characteristic of the Germans, they ascertained that the animal was fond of dough-nuts; and the same night, when he was fast asleep, they would deposit enough of these cakes in his hole, to keep him alive for the six weeks he was to be thus imprisoned. At the end of that time they would liberate him, and the occasion would be one of dancing and merry-making. Hence, the dough-nuts were called Fast-nacht cakes. The Yankees call the Ground-Hog, Woodchuck. The name originated thus: In the New England States, the season for making maple sugar is in February and March. When the weather is warm and dry, the sap will not flow. Therefore in order to keep the weather cool, the Yankees adopt the German custom, in deceiving the Ground-Hog into returning to his hole, and feeding him upon dough-nuts. When he goes in, they chuck chunks of wood into his hole, to keep him in until after sugar-making, Hence they call the animal a Wood-chuck. History records, as a significant fact, that every eminently successful person that ever lived, was a believer in the Ground-Hog; and that every person who ever met with misfortune, could trace the cause to disregard of some Ground-Hog sign. The Germans are proverbial for their thrift; and it has often been remarked, that they will get rich where almost anybody else would starve. It is all owing to the respect they have for the Ground-Hog, his signs and teachings. One might as well attempt to prevail upon the Dutch farmers of Pennsylvania to discard the Bible or the Dutch Almanac, as the Ground-Hog sign; and they are almost invariably prosperous. You’ll have to get your magnifying glass out to read the poems though. So what’s the story about my mailman? Well he USED to be our mailman, but he still parks on our street. He doesn’t talk to people, but he talks to the groundhogs that live across the street. And guess what he throws them every morning! A bag full of doughnuts! No joke. I feel like this article really answered a lot of questions I’ve had about life. I am pretty close to my older sisters, to the point where I kind of forget that they’re my half-sisters. We have different fathers. I mean, I KNOW that their dad isn’t my dad, but sometimes I still forget that means they have an entire family that I don’t have. My lovely sisters (and me, the cute blonde one). You gotta love an awkward Santa picture. 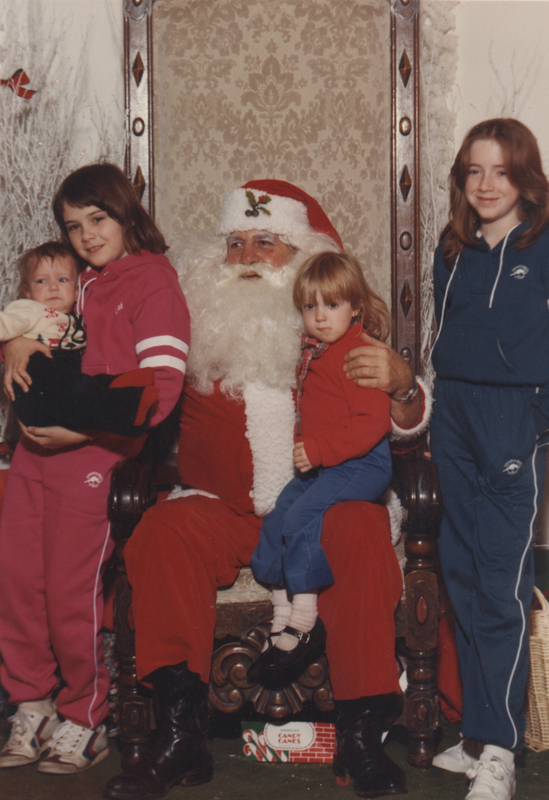 And sisters in matching tracksuits. I was reminded of this last weekend when I got a frantic text from my sister and niece asking me if I had any family history information. My niece needed it very quickly for a Sociology assignment she didn’t know she had. I was DELIGHTED to be able to help and also share some fun and interesting info about our family. I pulled up my sister in my tree (as my niece decided to focus on her maternal side) and I realized I only had half of her tree. So I helped with what I could and told her to get some info from her dad and I would try to fill in as much info as I could. I found out some amazing information. I feel like I never even knew my sisters! They are straight up 1/4 Irish. Their dad’s mother came to the US from Ireland. What?! I had no idea! Once I hit Ireland with that branch (Mullery) I had a hard time going back farther. So I decided to focus on the Jennings branch. Here’s a little backstory. Currently the whole entire family lives in Indianapolis. Like…everyone. Keep in mind that every single one of my siblings was born in a different city (and mostly different states). I didn’t really “meet” my brother until I was about six because he moved out when I was born. And before my grandparents moved here in the 1960s NO ONE from the family lived in Indiana, so it’s kind of amazing we all ended up here. My mom’s family is all east coast. In addition, none of my mom’s husbands were from here, or so we (or they) thought. Turns out the Jennings branch (my mom’s second husband) spent quite a bit of time in Southeastern Indiana, in Dearborn County. Robert K. Jennings is the father of my two sisters and adoptive father of my two brothers. His grandfather, Clyde Addison Jennings…born in Indiana! Clyde went to school and became a news editor! Kind of cool, right? Specifically he was born in a small town called Moores Hill. I came to find out that Moores Hill was the home of a Moores Hill College, founded in 1854. The college later moved to Evansville and changed the name to the University of Evansville. I’m guessing the relocation of the college was not great for the little town. I’m going to have to make it a future day trip. Clyde’s dad, Thomas Jennings was a well-known Civil War veteran in that area. 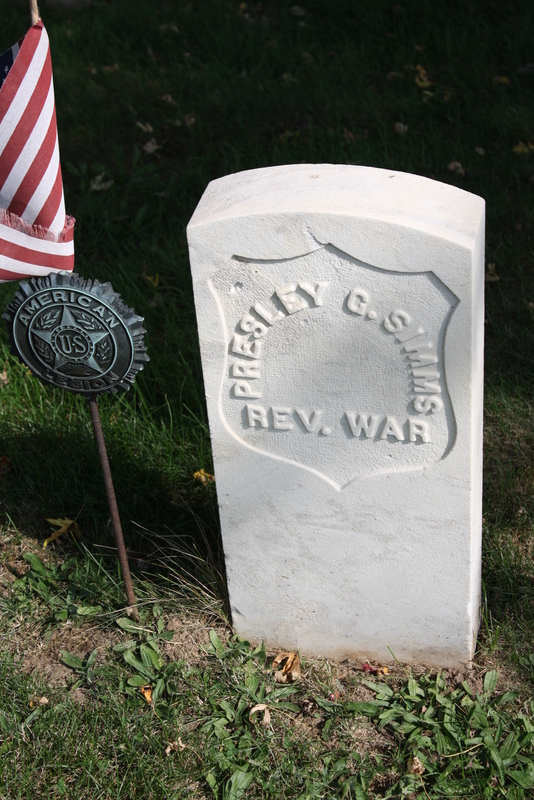 He was born in Missouri but spent the majority of his life in Moores Hill after the war. He opened up and ran a drug store. He was essentially the town’s pharmacist. Thomas A. Jennings, Moores Hill druggist. Thomas and his wife, Maria (Smith) Jennings are buried there in Forest Hill Cemetery, less than an hour and a half from my home. I am going. The next nice Friday…I’m going. I will update after I visit what I imagine is a super cool town. And maybe I’ll go to Cincinnati. And IKEA. Because IKEA. I am a goodreads.com user. I always have a resolution for how many books I will read each year and last year I had great intentions. 2015 was 24 books. I can read two books a month right? I failed. I read 17. FAILED. I wasn’t even kind of close so that I could read a few books over Christmas to catch up. Today I got onto this blog because I realized I had a few comments I hadn’t approved. How many posts did I make this year? One. ONE! 2015, you’re killing me. I get that I have a toddler who doesn’t like when I do anything except play games and play-doh with her. Not an excuse. I am vowing to get 6 posts in this year. At least once every two months. 2015 was a year of feeling kind of cruddy and I let it get me down. 2016, not gonna happen. Here it is. Blog #1 of 2016. Don’t worry. I’ll do another one that’s actually about genealogy. The Brick Wall is cracking! There are a few brick walls in my tree that drive me a little nuts. One of them being good old Alexander Brown…where I get my surname. One of the worst is on my husband Andrew’s side though, where he gets HIS surname: James A. Nelson. I believe the A to stand for Alexander but I am not completely positive. I finally decided to follow the genealogy rule of “people move together”. I knew his wife’s mother, father, and siblings…so I followed their movement. What I found were familiar towns, familiar names, and good old James A. Nelson, well after I thought he’d died somewhere in the western wilderness. I also discovered his brother, Adam Rankin Nelson. At least I think it’s his brother. I’m not sure why, but James ended up in Missouri in 1870 living with his brother and his family, leaving his own family in Keithsburg, Illinois. His brother continued south to Dallas. I found him living there in 1880. Once again, James is nowhere to be found after 1870. But that’s ok, there has been progress! So what else did I learn from this new info? Adam was born in Scott County, KY just a few years after James was born in Kentucky. So I am assuming for now that James was also born in Scott County. Their father is from Pennsylvania and their mother from Virginia. I wouldn’t be surprised if James was also their father’s name. It was a name passed down through generations in that family. Through both brothers. Andrew’s middle name is even James (even though it’s really for his grandfather through his mother). I am grateful for the person who posted the biographical sketches from Dallas County Texas for me to find some information about Adam Rankin Nelson and his son. Good old internet. Where would we be without you? Other information I have gathered from James Nelson is very interesting. He seems to have been (along with his brother) the original developer of Broad Ripple, on the north side of Indianapolis. He laid out the area south of the canal and called it Wellington, after the Duke of Wellington, and the north side was platted by someone else and called Broad Ripple. Both areas sort of competed with each other to be the major focus of commerce in Indianapolis (which would actually now be the current downtown Indianapolis thanks to the White River which was actually kind of useless for any sort of commerce). So obviously neither won that competition, but Broad Ripple definitely won in the name game. The name of Wellington just sort of fell off and the whole area is now known as Broad Ripple. Nelsons (my in-laws) still live 5 minutes away from his invention of a town, and I love that. 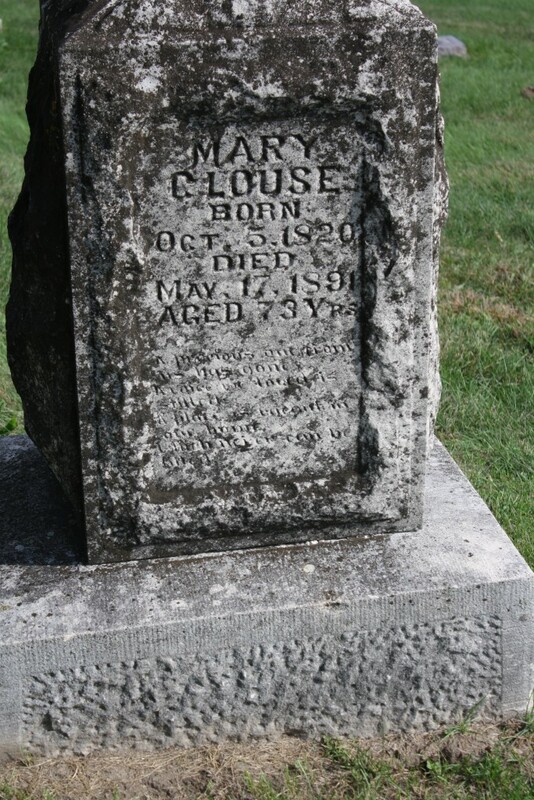 One of the interesting things about doing genealogy is discovering “cause of death”. I know it sounds a little morbid, but what’s interesting is how much has changed over such a short time in terms of actually assigning a cause. Science is better. Medicine is better. Autopsies….probably better. 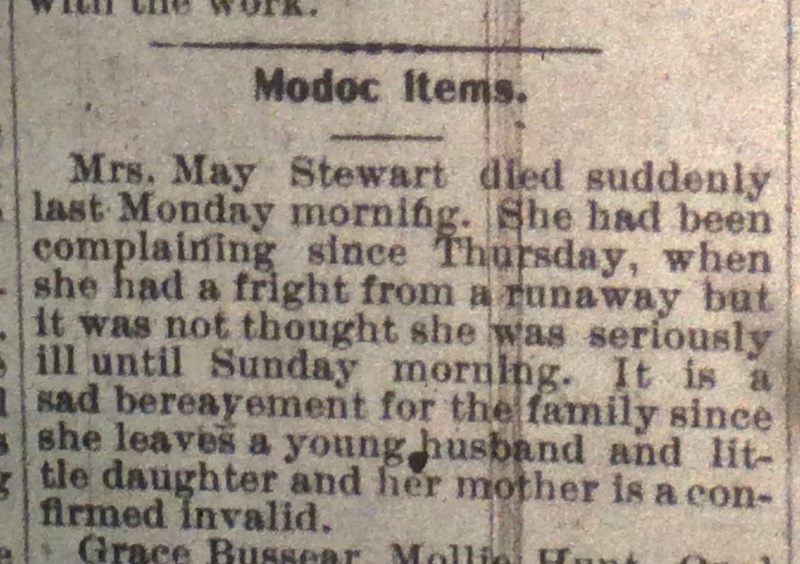 As I was finding info on a friend’s tree I came across the death notice for her gg-grandmother, a Mrs. May (Hunt) Stewart from Modoc, Indiana. Never heard of Modoc? Yeah, same here. Death notice for May Stewart, April 1901. So, the runaway is referring to a horse…not a teenager or a train. I think she was actually on the horse. So yes, that would probably give me a fright as well. But would it scare you to death? What do you think? Scared to death? Did she hurt something and didn’t recall because she had been so rattled? Did she have a congenital heart defect? A too-tight corset? It’s a sad story but especially so because being frightened by a runaway horse doesn’t seem like a valid excuse to die at such a young age, just 21 years old. So, one of my favorite things about doing genealogy is coming upon these wild stories in families that people knew nothing about. A lot of times horrible things will happen and people don’t want to talk about them and they get swept under the rug. These stories get lost in history. I found one of those stories today! I started a new tree for a friend with the last name of Totten. While she was here I hit a few little roadblocks but once she left I had some more time to delve a little deeper into her Totten branch and figured out how her family got to Indiana. The first Totten to have a child in Indiana was Calvin P. Totten who came to Johnson County with his parents and quite a few siblings. Ack! What?! I must know more! This came from an article in the Cleveland Leader on Aug 31. I couldn’t find anything online from the Indianapolis News or Star about this so I’ll be looking tomorrow. How will I look tomorrow? I knew you’d ask. Well, tomorrow is my birthday. Andrew asked what I would like to do for my birthday and I asked him if I could spend some time at the State Library because it’s been about forever. Today, after working on this Totten tree I have even more to research! I could spend all day there. Happy Birthday to me! The Totten that I know was shocked at this bit of news. Although she did respond with a, “Tottens are pretty intense.” HA! I hope to find some more info tomorrow to pass along to her. I am also interested to find out if her grandfather Totten (still alive) knew anything about this craziness. It seems that many (not all of them, obviously) of the Tottens may have left Indiana after this incident so there may not have been a lot of family around to even bring it up. So I found an article in the Indianapolis News from September 1, 1902. The article is pretty wild, and obviously very sensational writing (given the times) so I think I have to post the whole thing. Imbued with a jealous rage that had been rankling within him for several years, Calvin P. Totten murdered his wife by shooting her with a revolver, Saturday evening, and then turned the weapon on himself. A bullet in his brain caused his death an hour and a half later at City Hospital. The shooting occurred at the home of Mrs. Benjamin Carr at 216 East New York Street, where Mrs. Totten and her sixteen-year-old daughter, Minnie Totten, had gone to make a social call. Because of domestic differences, Mrs. Totten had left her husband several months ago, and refused to live with him. She had applied for a divorce on the ground of inhuman treatment on several occassions. The threats of Totten to take her life had caused the family no end of alarm, and care was exercised to keep Totten from ascertaining the whereabouts of his wife. The woman moved many times to keep from coming in contact with her jealous husband. Recently she had been living with her daughter Minnie at 427 East Market Street. The girl is employed by the New Telephone Company. Last Friday Minnie saw her father lurking near their home and Mrs. Totten in moral dread, asked the police to lock him up. Superintendent Taffe allowed Totten to go free on his promise to leave the city immediately. He was not seen again until he appeared suddenly in front of the Carr home. She seemed almost paralyzed with fear, but managed to struggle to her feet as though to escape. She was too late, however, as Totten with the expression of a demon in his face, drew his revolver and began firing. With a scream Mrs. Totten staggered and was about to run into the house when four shots from the revolver came in rapid succession. The woman fell heavily to the floor of the porch, three of the four bullets having inflicted fatal wounds. One of them had passed through her heart and the other three entered her back. Mrs. Carr was so close that the bullets almost touched her as they sped by to their mark. Minnie Totten fell in a swoon and the man turned toward the street. The firing attracted the attention of a dozen or more men passing in Massachusetts Avenue nearby. They ran to the house and the murderer coolly emptied the shells from his revolver and filled the chambers with fresh cartridges. Waving the weapon defiantly at the crowd he started to run east in New York Street. The men followed him at a respectful distance, and when Totten realized that escape was impossible he stopped and fired a bullet into his right temple. The couple were married in Franklin seventeen years ago on the wife’s nineteenth birthday. Totten at that time was thirty-six years old. Mrs. Totten’s maiden name was Cora Kipheart, and her brothers and relatives are well-known citizens of Johnson County. 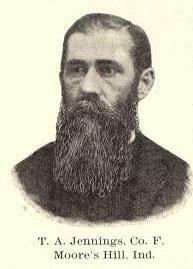 Totten was also a member of a well-to-do family. He was employed as a carpenter and a bricklayer. Totten from the start had a jealous disposition and this culminated in an unreasoning suspicion that his wife was not true to him. Quarrels were frequent, and as a last resort, and after sixteen years of suffering, Mrs. Totten decided to separate from him. This only developed and strengthened the man’s jealousy and he swore often that he would someday take her life. Yesterday evening at 6 o’clock both the bodies of Mr. and Mrs. Totten were buried side by side in the little graveyard at Bargersville, Johnson County. It was in this little village that Mrs. Totten was born and reared, and it was there she first met Totten. There was much feeling against Totten among the relatives and friends of the dead woman, but it was finally decided that both bodies should be buried in the family plot next to the grave of one of their children. 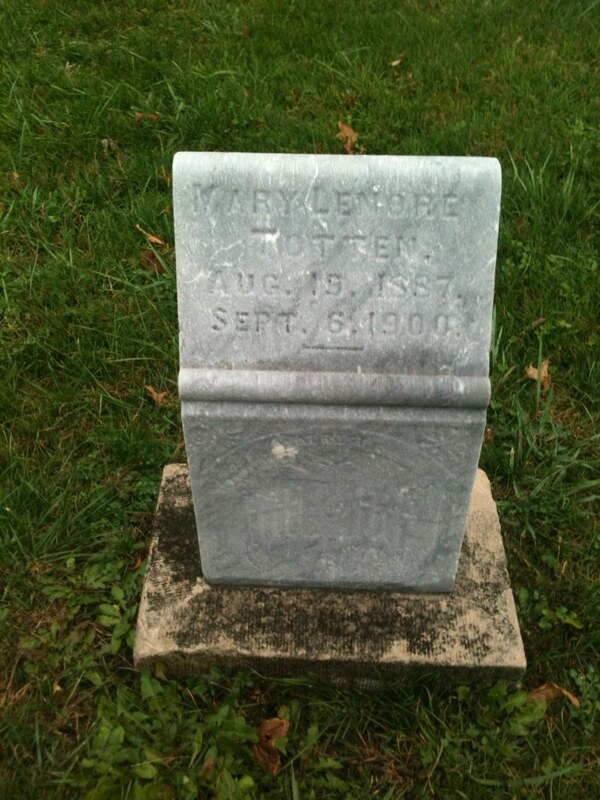 The grave of Mary Lenore Totten who died just two years before her father killed her mother and himself. She was just 13 years old. Bravo, 1902 journalist! Well-written, sir! One thing that always amazes me about reading these old stories…they are so rarely labeled with the name of a writer. The next time I get some time to go to the library I hope to check out some of the newspapers from Johnson County during that time. Any Tottens or Kiphearts out there in the world ever hear about this story? Please comment! So, my buddy Jumwaltie and I had a few hours to kill on a Friday afternoon. We had taken a trip last year out to Montgomery County (and learned that all dogs in Montgomery County do not love strangers and will chase your car) to visit some cemeteries to find some of our significant others’ family members. We are still looking for how they may be related. We don’t have a link QUITE yet, but we’ll get there. We decided to take a trip back. We started towards New Richmond, IN. This is a surprisingly adorable little town that actually made me squeal at it’s preciousness. On the way we stopped at a couple of smaller cemeteries.and just looked for surnames that looked familiar. 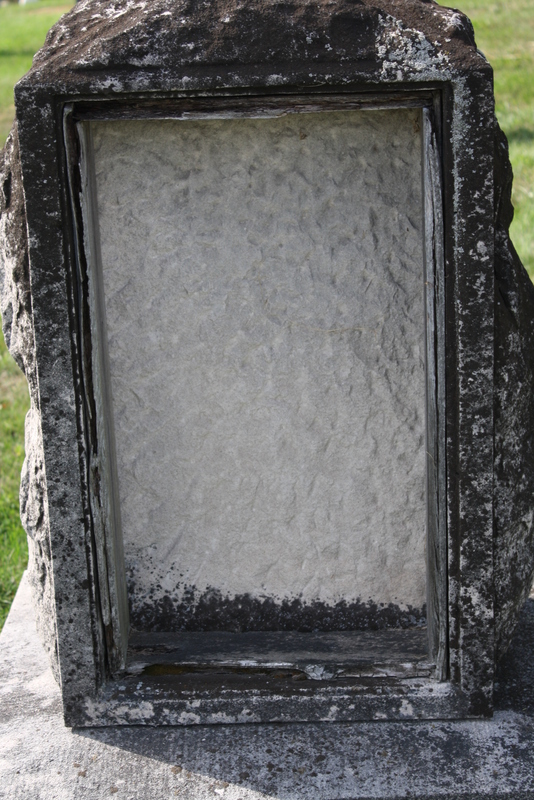 We also love finding bizzaro headstones. We found a couple of interesting ones, some with weird names, and some of Revolutionary War vets (which is always interesting to find in Indiana). Our first stop was Mt. Pleasant Cemetery, which actually seemed to be two cemeteries across the street from one another, one side decidedly older than the other side. 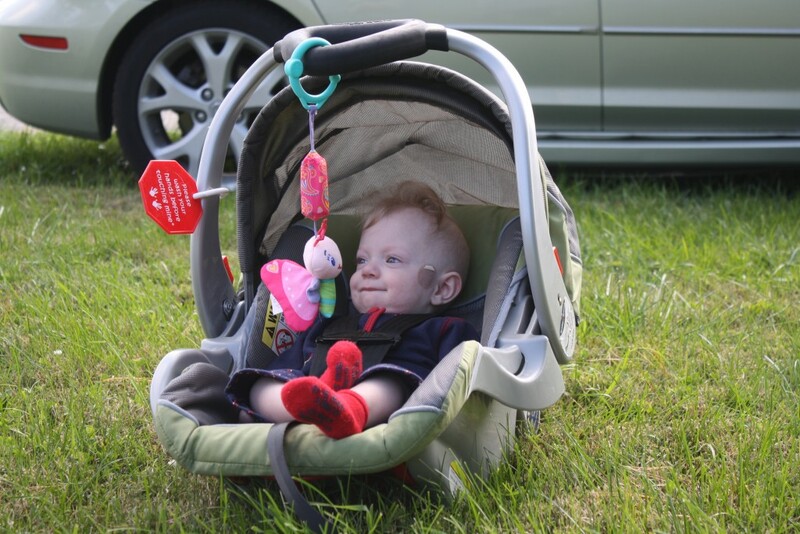 We stopped to have a look around and have lunch – picnic style! Coraline watching us in amusement while we ate sandwiches and apples. What a lovely little picnic. 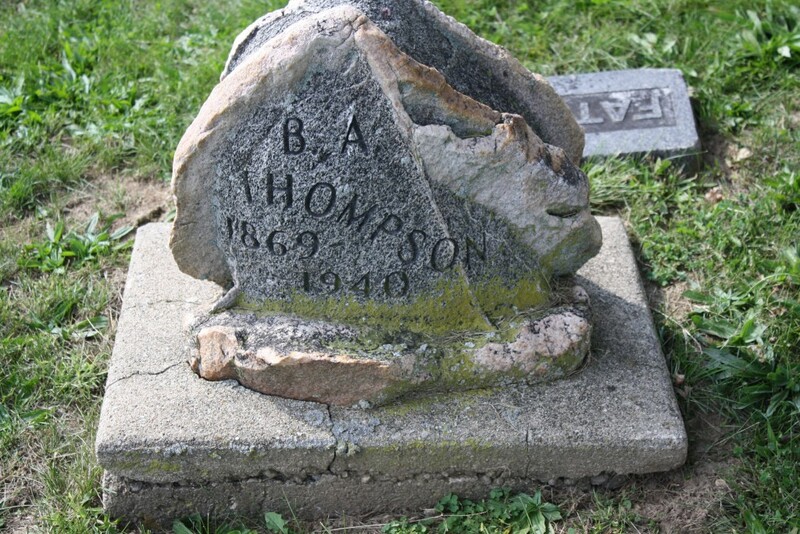 Very strange headstone for B.A. Thompson. Was this look the goal? I’m not sure which is the front and which is the back. But on one side we find the inscription. on the other side is a box to put in decoration? Or memorials? Or…what? 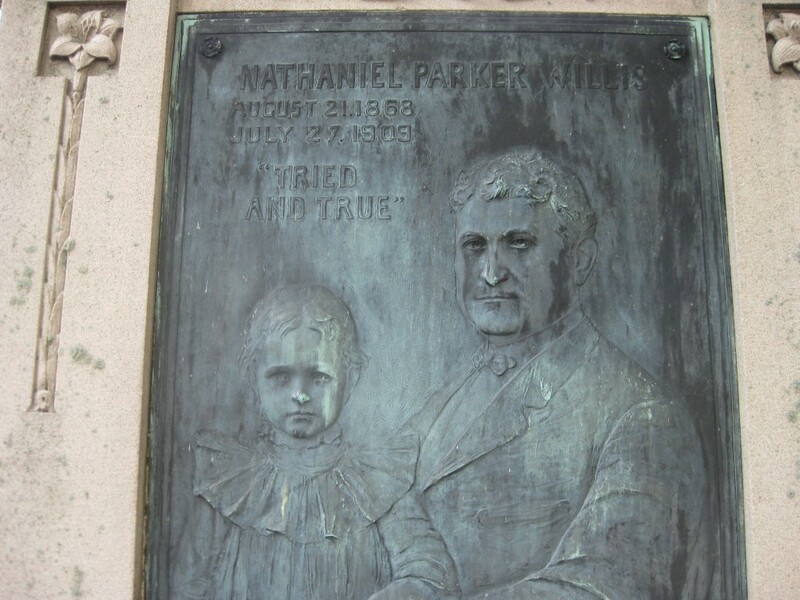 Relief picture of Nathaniel Parker Willis and his daughter, Mary Frances Laura Willis. I wonder what happened to Mary. So I thought, was he ACTUALLY murdered? Or is this metaphorical? How was he killed in a court of justice? Huh? So Jumwaltie and I decided that we would look this up when we got home cause it was just too weird. Soooo….we did. Nathaniel and his wife, Hattie, were not married in 1899/1900 and lived in Indianapolis with Nathaniel’s mother, Frances. 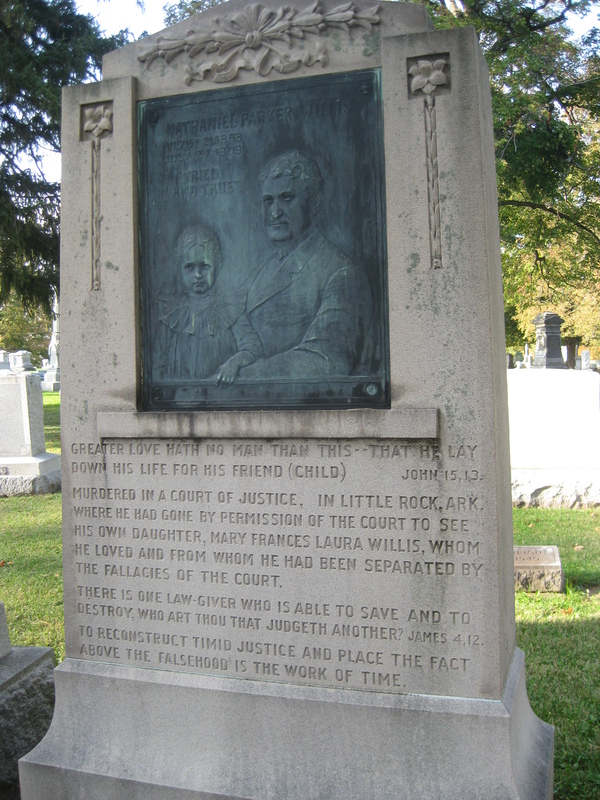 They had little Mary Frances Laura Willis and within 18 mos they were filing for divorce. The mother claimed that Frances was a crazy lady with a horrible temper who she didn’t want her daughter living with. She also said that Nathaniel was cruel to her which was why she wanted the divorce. The wife left town with the child, claiming that at one point Nathaniel had done the same and tricked Hattie into kidnapping her. It sounds like she left with Mary and Nathaniel wasn’t sure where…and he spent years trying ti find her and finally did in Arkansas. He won the custody case that then took place in Arkansas. When they were meeting up to discuss transfer of child, Hattie’s new husband, W.Y. Ellis, came to the meeting and pulled a gun, nearly missing a Senator when he shot, and got Nathaniel in the heart. Wow! What a sad and amazing story. It actually reminded me a little of the book Indiana Gothic, by Pope Brock. This was a great book that Brock wrote after he started researching his family history and learned of this terrible scandal, tragedy, and court case in his family’s past. I thought what an amazing story this could be if written into a novel. Someone get started on this, pronto! Sadly we were unable to find any Bastions here, and the cemetery office was closed (we were obviously very prepared and organized on this trip) and headed home. Then I went to dinner. Then my car was broken into. That’s a story for another place. Wah Wah….. I want to start this post by announcing that I am back in the saddle again, after that hiatus…with the kid and the hospital and the transition and all that jazz. We are cool now. Well, actually I’ve started waking up at 6am every day to get a little time to myself where I am not washing dishes or clothes, entertaining a baby with a very short attention span, or trying to get said baby to eat. So now I have a little more time…as well as a little more exhaustion by the end of the day, but I’m pretty sure it’s worth it. So…I made a discovery in the Munn family. Well, I thought it was a discovery, because no one had ever thought to tell me about it. Turns out it’s not a big secret, but a very interesting story! So I started using this site called www.newspapers.com very recently. I thought I would try it out for a year to see if it was of any use. And OMG within seconds it paid for itself. I found all kinds of stuff I had been searching for FOREVER. Brick Walls broken down! Hooray! Anyway…I most recently found a crazy story about my great grandfather, John Darl Munn Sr.
John was born and raised in Darke County, Ohio, much like the rest of our crazy clan, and when he and his wife Eva had raised their kids and they all moved off they decided to move out to Arizona! They lived in Tucson for quite awhile. John had been a farmer on Ohio, but he was also a barber. He obviously had quite the flair for hair, as you can tell in this amazing picture. Check out the coiff on Mr. Munn! I wonder if he was a Dapper Dan man. 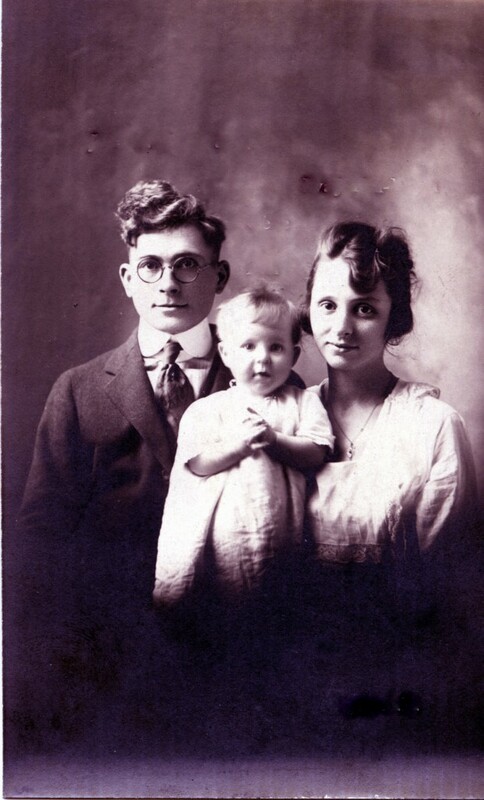 My great-grandparents are holding my grandmother, Gene Odell (Munn) Brown in this pic. John was doing hair out in Tucson. He eventually rose in the ranks of the Barbers’ Union. Yes…there’s a union. And he became the president! Then he resigned and left the union completely. Supposedly there was a disagreement over some rules that had been passed and John Munn was done with them. And he felt like he didn’t need to abide by those rules since he was not a union member anymore. Some of those rules involved not posting your prices. There was also a set price that all barber’s would use ($1.00 at that time, which undercut other barbers). They would also only be open on Tuesday-Saturday. I’m not sure which rules he had the most issue with. The reason this was all in the newspaper was because shortly after leaving his post after the disagreement, his shop was BOMBED! Yes, you heard that right. Bombed. Now, the Union claims that it had nothing to do with it. But seriously? How crazy is that? A barbers’ union. I guess Arizona was still kind of wild west-ish back then (just before the Sunbelt explosion), but it sounds more like The Sopranos than anything else. So I called my dad to tell him what I had found, thinking I was going to be giving him some new amazing information. And he was all, “Oh yeah…I never told you about that? They also tried to run your grandparents off the road once while they were driving.” Yeah…no. You never mentioned it. Turns out the union also took him to court…sued him. They were pretty mad, it seems. I’m not really sure what came of the case, but if I find out I will update. Here is the article and picture taken post bombing. 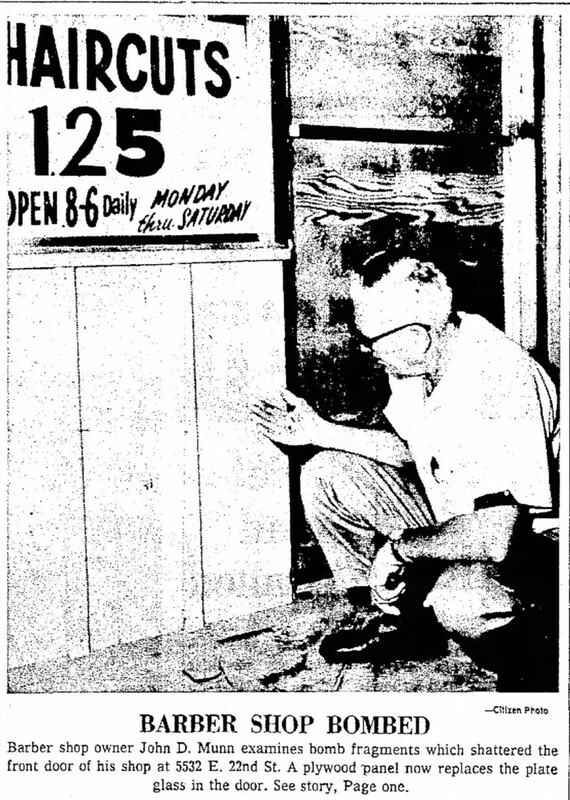 John Munn inspects his shop after it's been bombed! Here is the link to the article in PDF, for those interested in reading about it.